I better not mess it up this time around! We’ve seen two other mixer brands so far. A bare bones 4-channel Alesis for $80, a great 10-channel mixer from Yamaha for $150 and now this beast. It’s the 8-channel Behringer XENYX X1204 USB for just $180. Ok so calling it a beast might be a bit of an overkill considering what else is out there on the market but I can totally justify it for this use case. This is a fantastic mixer and while there are better ones out there, there isn’t anything that matches the performance and features of this mixer for the price. Mackie is famous for their quality mixers and Behringer is famous for copying Mackie. So take advantage of that. It’s like getting a Hyundai instead of a Honda. Both are great cars, one just has more features and costs less. I feel like I should also bring up Behringer XENYX X1222USB. It will future-proof you a little more by allowing you six microphones four of which have compressors, a 7-band graphic equalizer and some other processing features including a Karaoke mode (!!!) and a feedback detector. 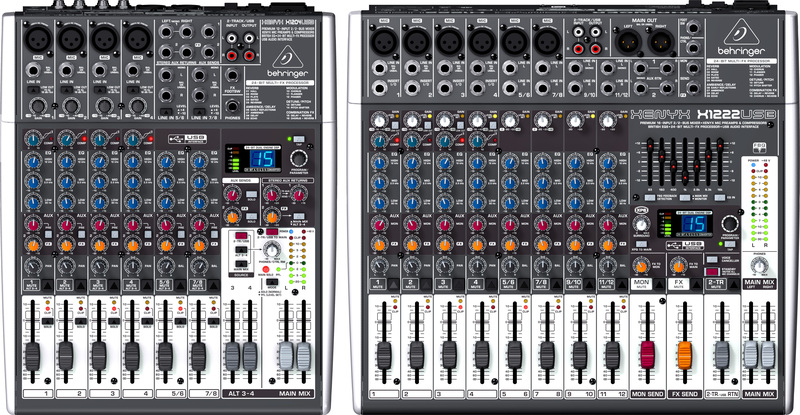 Here’s a side-by-side of the boards so you can visualize the difference and the improved layout of the larger mixer. The X1222USB is significantly larger than the X1204USB as you’ll see. For me the 1204 model seems like a great mix of features, price and inputs. Part of me thinks, go for the 6 mic version but we’re being more realistic here. How often will I have more than four people on mic anyways? If I get to the point that I’m regularly putting that many people on a show at once I hope I’m making enough money on the shows to upgrade haha. When/If that day comes I’ll put the Behringer XENYX X2442USB on my short list. It’s $380 and brings with it 10 microphone inputs, 8 of which have compressors. Perhaps THIS is the real beast. For those of you who insist on due diligence. The Mackie mixer that Behringer has cloned in this case is the Mackie ProFX8. It’s a great little mixer that adds a sturdier build and slightly higher quality components along with a 7-channel equalizer and a more detailed metering display for $230. Not a bad deal. But it’s missing compressors on the mic inputs and no ability to solo a channel. To me I’d rather save that fifty bucks and have those compressors. And to put a nail in the coffin, on Amazon the Mackie ProFX8 has 25 reviews averaging four stars. The Behringer XENYX X1204 USB has 86 reviews averaging four stars. Social proof for the win! This podcasting studio employs the use of a digital audio recorder. You may think this is unnecessary when you have a computer available to record the audio but trust me, that is not an ideal setup. Should your computer crash on you in the middle of a recording you’d lose your show. This is your backup system. This time around we’re using a Zoom H4N Handy Personal Audio Recorder. For most people this would be an overkill. If you don’t see yourself leaving the studio or using your Zoom’s microphones you are totally OK sticking with the Zoom H1. But if you have plans of doing on-location recording with two or fewer people get this guy. It adds XLR inputs for connecting your microphones for a all-in-one, two-person podcasting studio. It feels awesome in your hand and immediately let’s you know where that extra $130 went. The build is solid, the screen much easier to read and the controls are a dream to navigate. Personally I’m going to save the money right now and stick with the Zoom H1 I already own but if you choose to use this recorder make sure to take advantage of the XLR inputs from your mixer. Previously I recommended the Audio-Technica ATR2100-USB vs the Audio-Technica AT2005USB. Both of these microphones were of the Dynamic variety. This time around, since we’re also talking about the possibility of recording vocals and instruments in this studio, we’re upgrading to Condenser microphones. It’s the Audio-Technica AT-2035 at $150. Oh and that price includes a shock mount, an XLR cable and a pop filter! Generally speaking condenser microphones are more sensitive, a greater dynamic range and a richer sound. They make for a fuller, more rounded sound. In my studio at work I use the Audio-Technica AT2050, one model above this, and I just love it. For a savings of around $100 you get the AT2035 which sounds a lot like the more expensive AT2050. One thing the AT2050 has that I wish the AT2035 had is the three switchable polar patters; omni, figure-of-eight and cardioid. Not a deal-breaker but that would be nice for more complex recording situations. Just so you know, the AT2035 uses the Cardioid pattern. You might be tempted to get the Audio-Technica AT2020 for $100 but by the time you add the shock mount and pop filter you’ll pretty much eat up any discount. Plus you’re getting a better microphone. Spend the extra $50. One thing to keep in mind with these microphones is that they are sensitive guys. If you’re recording in a noisy room these microphones may be a problem. You’ll need to switch to dynamic microphones. You can use the ones mentioned above. In the room where I’ll be recording I have a 144-bottle wine fridge that is quiet but not silent. I did some testing with a few condenser microphones I had handy (Zoom H1 and Blue Snowball). I discovered that with proper placement and some editing in GarageBand I was able to mostly eliminate any room noise. I imagine that with careful placement and some trial-and-error, I’ll be able to eliminate 90% of the fridge hum. If not all is not lost. They make microphone isolation shields to assist in this. 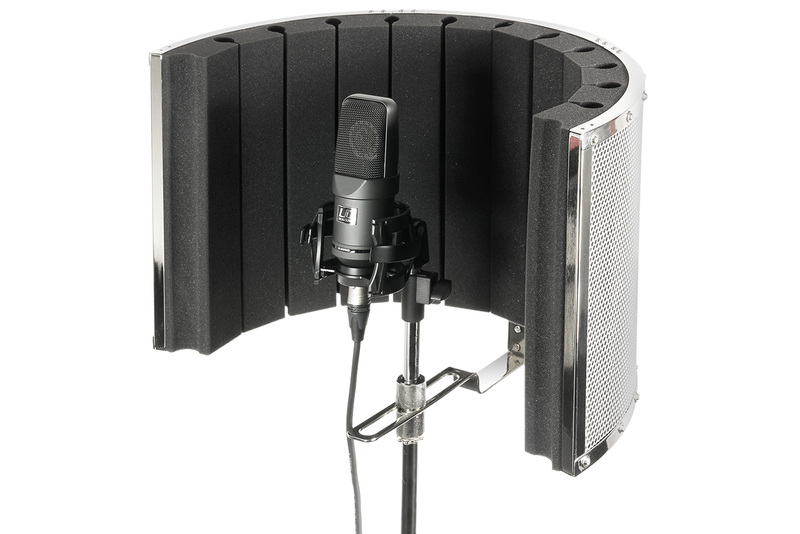 Microphone Isolation Shields are basically parabolic semi-circles lined with foam you place behind the microphone. You can buy them for $100-250 each or make your own for much less. Here’s a good DIY guide. They help block sound coming from behind the microphone and also stop your voice from bouncing around after it passes the mic. If it becomes an issue for me I’ll make some small versions of the one you see above but I’m not too worried. Now that we are starting to spend some real money on this setup, it’s time we start thinking about spending real money on headphones. A ton of people use Sony MDR-7506 ($100) headphones for their studio listening.They were born for studio listening. They’re great and it’s hard to say something bad about them for an application like this. Except I find them uncomfortable and cliché. But if have $100 to spend per headphone, feel free to pick up a pair of those. You won’t regret it. Another option for a great headphone here would be the Audio-Technica ATH-M30x ($70). It’s a great compromise between the ATH-MX20x ($50) and the ATH-MX40x ($100). I could have recommended any one of the Audio-Technica headphones in this lineup for each of these system but I wanted to provide a bit of variety. Which is precisely why I’m choosing a wildcard for this setup. Why not give the Sennheiser HD 419 ($50) headphones a try? You’re probably wondering why I would choose these over one of the several Audio-Technica options. It comes down to comfort. I live in San Diego and my studio space gets pretty warm in the summer. We’re talking as high as 85 degrees. The Audio-Technica headphones are great cans but they are hot and their pleather padding doesn’t do you any favors. The Sennheiser HD 419 design is based off the HD 555/595 headphones which are some of the most comfortable headphones ever made. I have the Sennheiser HD 600, once called the best headphone in the world, and I have to say, they are insanely comfortable. There is something about sweaty ears that doesn’t entice me. These headphones are still sealed headphones so they will block out most of the room sound while preventing any sound from leaking out. Plus they sound wonderful for music should you ever want to use them casually. They’re just great headphones and for $50 a steal in my opinion. I would be remiss if I didn’t mention another pair of Sennheiser headphones. These would be the Sennheiser HD-280 Pro ($85) headphones. I’d compare these to the SONY MDR-7506. Absolutely perfect headphones for this sort of application. Honestly, of all the headphones I’ve recommended so far, these would be my top choice. I love everything about them. But that $35 per headphone premium adds up to $140 for my studio setup. Since I’m not building a recording studio where these would really show off their quality it seems a bit of an overkill. If you have your own headphones you can totally use them to start just know that down the line, dedicated headphones that are matching pairs will be important. A headphone that accentuates one frequency over another might cover up, or exacerbate audio problems. I admit these Sennheiser’s do exaggerate a bit the lower-end but nothing like a Beats headphone so we won’t worry too much about that. It’s also worth noting that these are sealed headphones, as are all the headphones I’m recommending. Open-air headphones leak sound which can then get picked up by your recording equipment resulting in echoes, feedback loops and just general annoyances. Stick with in-ear or closed headphones. For regular music listening, where I don’t have to worry about sound leakage, I just about always prefer open headphones. Just not for a studio setup. There are a lot of reasons to listen to your podcast as you record it. First you want to make sure all the mics are recording. Once you have confirmed the microphones are working you’ll need to make sure they aren’t picking up anything they shouldn’t. But you could do that alone. The reason everyone needs a mic is because most people are pretty horrible at knowing how loud or quiet they are. This is especially true when they are on mic. People who aren’t used to being on mic will often times sit too far away from the microphone creating a hollow and quiet voice. 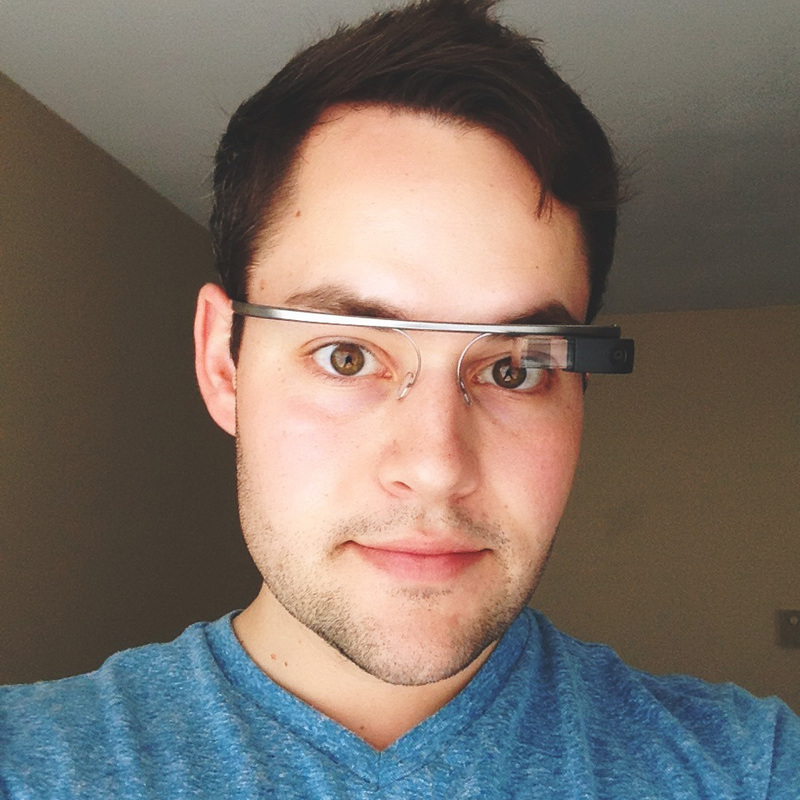 Wearing headphones allows them to self-monitor. With so many headphones you need a headphone amplifier to power them all. This is not like sharing earbuds from your iPhone. These are bigger headphones and being split four times. You could just keep turning up the volume but you will risk damaging the mixer and your headphones. Plus you cannot fine tune the audio for someone who might have hearing problems and needs a boost in power to their headphones. The Behringer HA400 is the best, cheapest headphone amplifier of its kind. At under $25 it’s a total no-brainer. I always recommend scissor-arm microphone stands. They make placing the microphone close to your subject easy all the while decreasing the chance of picking up desk vibrations or those when adjusting mic placement during a show. There are many better microphone stands like these but if you ask me, the cost of a microphone stand shouldn’t be five times the cost of the microphone. That’s just wrong. If you feel you’re might need a microphone isolation shield or if you want something sturdier you can pickup the ProLine MS112 Desk Boom Mic Stand. This stand won’t be as flexible in placing your microphone as the scissor-arm stand but what it lacks in flexibility it makes up in sturdiness. It features die-cast metal clutches and a heavy-duty die-cast base with a 1″-9″ telescoping boom and 12″-17″ adjustable height. Switching to this stand adds $14 per stand but considering the weight of the microphone, shock-mount, pop-filter and possible isolation shield, it might be the best option. How lucky are you? This microphone comes bundled with a shock mount, XLR cable and pop-filter. No need for me to sell you on why these are so important, at this point you already know and you’re getting them anyways. I’ve put together a complete shopping list for everything you see above on Amazon. If this setup sounds like it fits the bill just click here and you can get your show on the road! Plus by using my affiliate links I get a tiny kickback from Amazon which helps me keep this blog going, and invest in fun gadgets to review for you here! Not convinced that this will cover you? Why not try the next studio setup above this one? 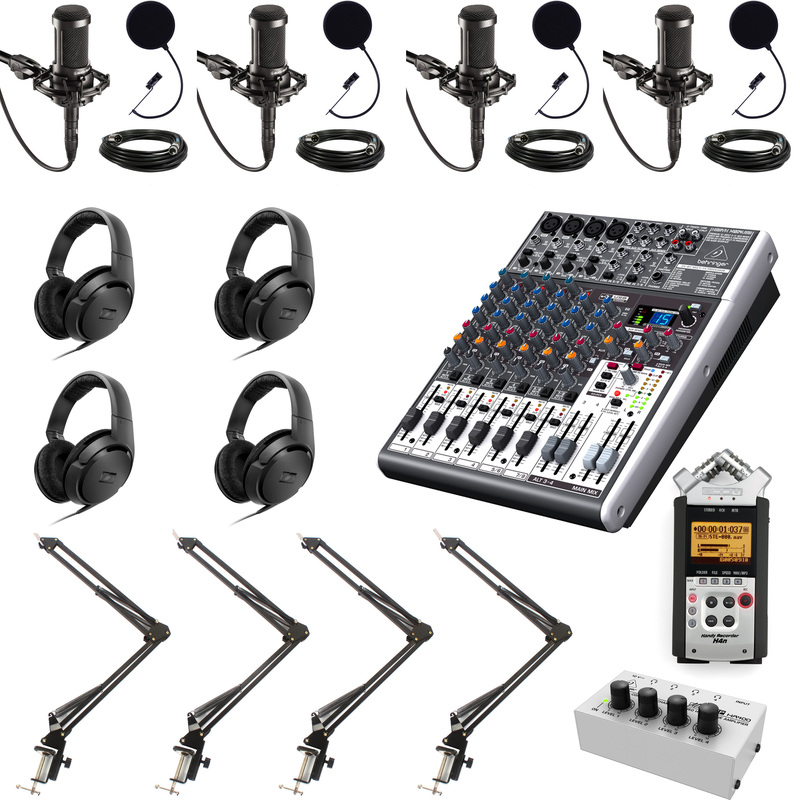 This entry was posted in Life, Nerdiness, Thoughts and tagged Behringer, Behringer Vs Mackie, Best Microphones For Podcasting, Best Podcasting Setup, Condenser Vs Dynamic Microphone, DJ mixer, Google Glass, Podcast, Podcast Buying Guide, Podcast Studio, Recording studio, XLR connector by Justin Scott. Bookmark the permalink.